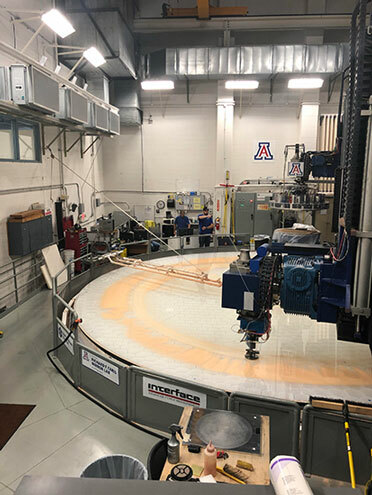 The Mirror Lab is located on the U of A campus in Tucson. You don't want to have a tour on the same day as a football game, and luckily the game with USC was completed just the day before. I got there early and found a close by parking structure and waited at the lab front door, out of the rain, for the tour to start. 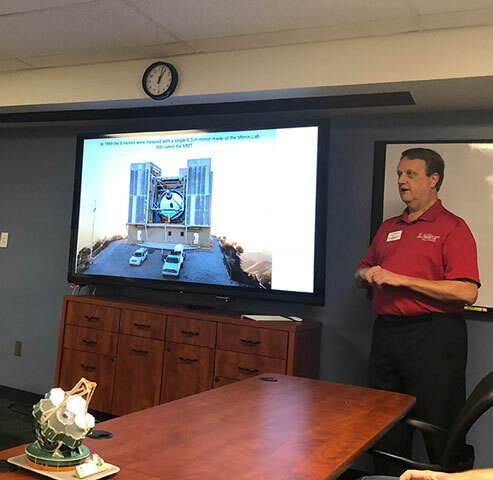 There was just 9 of us on the tour and our retired docent and amateur astronomer, Paul, showed us an introductory set of videos and then led us through the lab. 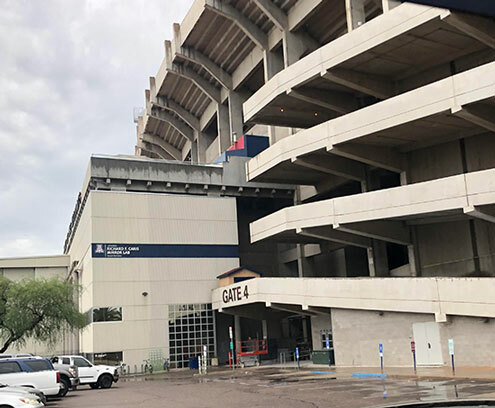 Paul told me that he too has been disappointed many times with the weather and Tucson is just now coming out of its monsoon season and he hopes to get up to the mountains for some observing shortly. When we were touring the Vatican Advanced Telescope (VAAT) on Mt. Graham, our tour docents told us that the 1.8 meter mirror used there was the first mirror that Dr. Richard Angel had fabricated with the new spin casting technique. 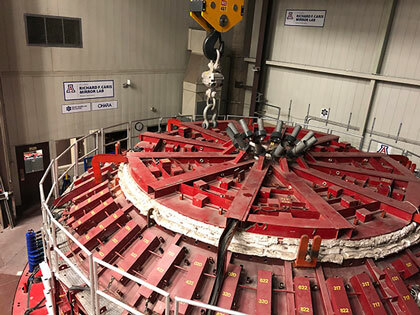 The spinning furnace causes the molten glass to form into a parabolic shape and once the mirror cools and hardens, this shape does not need all of the machining and grinding that was previously necessary. There was nothing in the furnace for our tour, but right next to it in the same high bay building was one of the just cooled mirrors for the Giant Magellan Telescope (GMT). Each of these8.4 meter mirrors requires about 20 tons of glass. 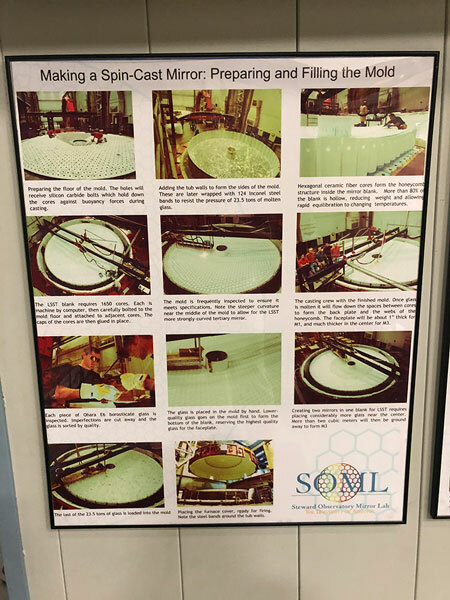 Remember that all of these giant mirrors now rely on a honeycomb type of mold, which maintains the strength by reduces the weight of the finished mirror. In this photo, the mirror technicians are removing all the excess mold material in preparation of moving the mirror to the polishing stage of manufacture. One thing I learned was that both sides of the mirrors are polished. The front side obviously has to be polished to obtain the very precise curve needed for the mirror optics. 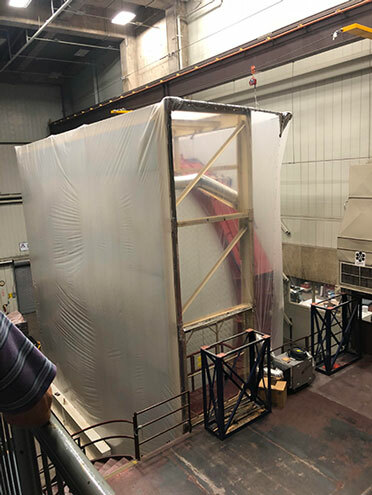 But the back side is important too in that it also is part of the mirror support structure and it is where some of the corrective actuators are installed to help maintain the correct shape as the mirror is moved about into different orientations and positions. Another one of the GMT mirrors is just now in the polishing section of the lab. It is interesting that even though most telescopes want a parabolic mirror design, the GMT is a bit different in that only the central mirror is truly parabolic. The other six mirrors that surround the central mirror must be designed with a slight asymmetry so that light that falls on them is indeed correctly sent to the main focal point. Luckily, it is all computer controlled. This asymmetry requires special grinding of the mirror that is also being done on the mirror blanks at the lab. No wonder it still takes 5-7 years to finish one mirror. Even this long time is still a big improvement over the time when the mirrors were just poured as a flat piece of glass. 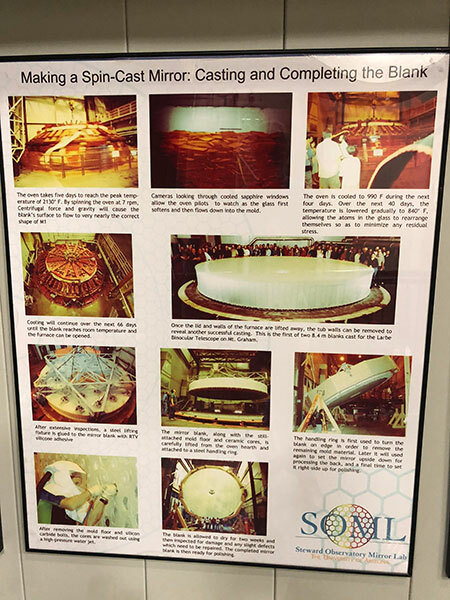 As I recall, each mirror must be cooled for something like 6 months just to get ready for the next processing stage. Th e grinding and polishing is all computer controlled. After each round of grinding and polishing, special optical equipment is moved into place and the accuracy of the mirror is routinely measured to ensure that the whole process is proceeding correctly and on course. The mirror is rotated slowly and the computer controlled polishing wheel moves about in a little pattern. A much bigger polishing wheel, seen in the background, just below the letter A, and covers a wider area and is used for very fine polishing. The lab works 24 hours for five days and then something like just a 12 hour shift to complete the week. The operators doing the polishing spray water on the mirror to help wash off the small bits of mirror that are polished away. The mirror design includes a tiny hole, maybe an inch in diameter, in the center to allow the wash material to flow down the drain. 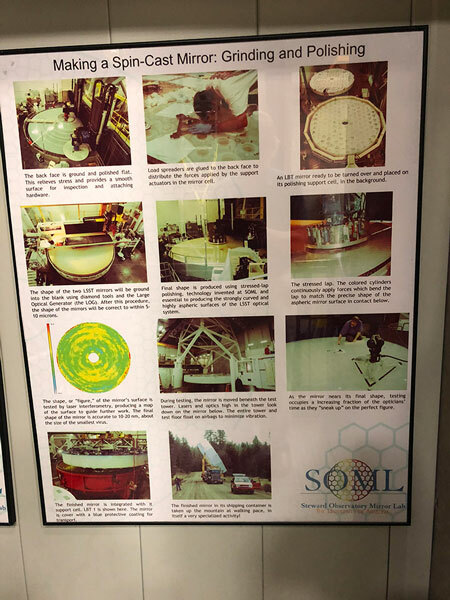 While we were on our tour, I found these three panels of photographs on the lab walls and these panels tell the story much more clearly than I ever could. So check them out if you are interested in the details. It was so neat to tour the mirror lab and see how these giant mirrors are made. 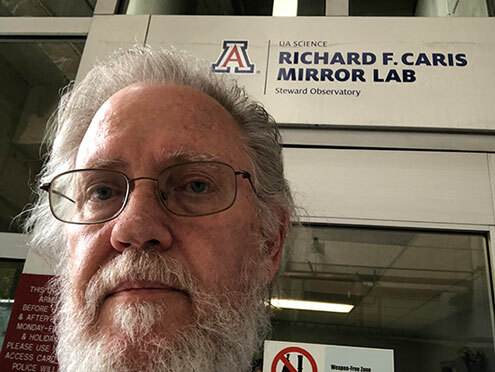 I can remember when my nephew, Carl, had a job in the mirror lab, and he told us about all the mirrors being fabricated. Sadly, Carl passed away several years ago now and I can't talk to him about my tour of the lab. It was a lot of fun now, finally being able to tour the lab, so thanks for the tour, Paul!